Tire Factory Inc. was started in 1977 in Mt. Pleasant, Michigan. Since that time Tire Factory Inc. has grown to become one of the most advanced and progressive tire dealers in the the United States, shipping tires, wheels and other related products throughout North America. Our customers deserve the best, so we give them the best. 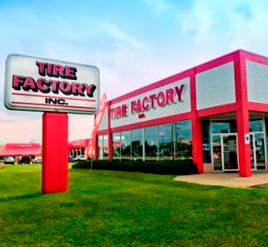 At Tire Factory Inc., we use our buying power to give you DEEP DEALS on tires from Nokian, Vredestein, Multi-Mile, Firestone, Cooper, Michelin, and many many more.